I had to take these three back to the library yesterday*. I've enjoyed them! Here is a bit more about each. 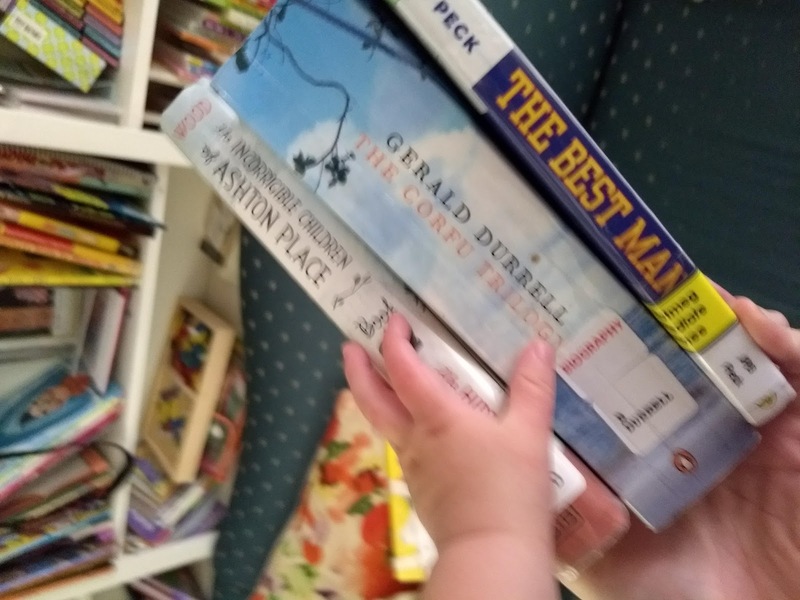 The Best Man by Richard Peck - This one is realistic fiction. The plot is hard to describe, since there isn't just one main conflict. It's about a boy growing up. He tells the story of his life and the two weddings he has been in so far (hence the title). The book spans from his 1st grade year through his 6th grade year. The writing is just SO good. Though the book touches on a lot of "issues," the most powerful moments surround the death of a grandparent and having a gay family member. Peck is a master, and I was so sad to hear of his recent passing. He has been contributing quality children's literature to the world for close to fifty years! Anyway, the characters in this book are fantastic, the pacing is just right. The dialog is really really excellent. I read the book myself, then had to read some of it out loud to my husband Jacob. Then my sister Clare came into town and wanted something to read. I suggested it and she was unsure until after I had read a bit of it to her. Then I couldn't stop reading it aloud to her, because I was having so much fun. And lastly, Benjamin (age 9) picked it up and read it, too. The Hidden Gallery (The Incorrigible Children of Ashton Place Book 2) by MaryRose Wood - I read the first one of these just recently and loved it. And it is a major cliffhanger! So I had to get book 2. This one was just as good. Book 3, here I come! The Corfu Trilogy (Book one: My Family and Other Animals) by Gerald Durrell - I will be getting this one from the library again! I only read two or three chapters of book one, My Family and Other Animals, before this book was due back. They were fascinatign and wonderful chapters, though! This is a memoir. As far as I've gotten, Gerald is the youngest, at about age 10, and his older siblings and mother are interesting and hilarious. They've decided to move to Greece, from England, and done it. Gerry has met the Rose-Beetle Man, and got his charming pet tortoise. They were just embarking on the subject of Gerry's formal education, when I had to return this. *When I say yesterday, I mean weeks and weeks ago, now. Summer got the best of me, and this post has finally been finished up now that it's autumn!